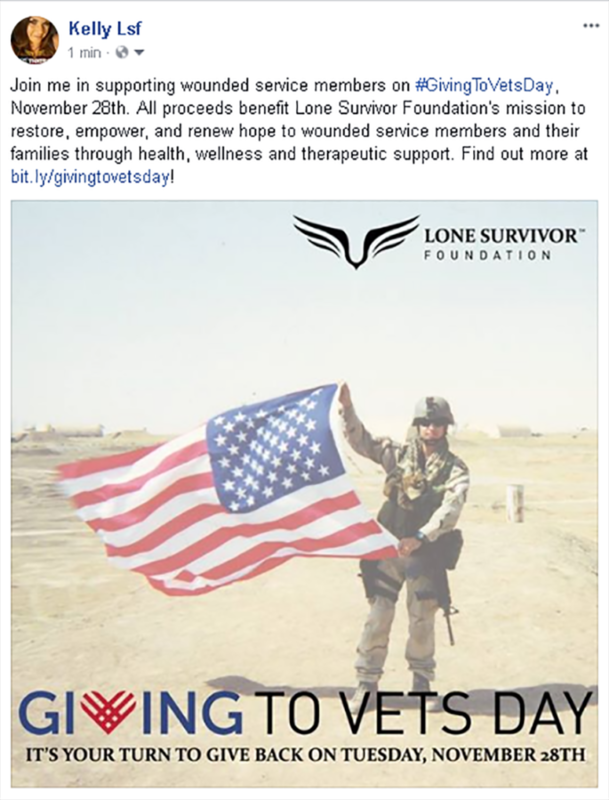 On Tuesday, November 28th at 7:00 AM Central/8:00 AM Eastern, please visit our Facebook page at https://www.facebook.com/lonesurvivorfoundation/ and make a donation using the button which can be found under our header image. Donations can be made here at any time, but let’s see how much of those matching funds we can get for our veterans! Please RSVP to our Facebook Event for reminders and updates. Facebook allows its users to create fundraisers and we’d like to ask for your help in rallying your friends for our wounded service members. It’s easy, it’s fun, and we’re going to turn it into a contest for you. We recommend getting started on your fundraiser right away. Did we mention there’s a contest? For Instructions on creating a Facebook Fundraiser, please click here. 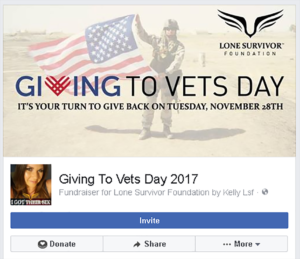 The top “Giving to Vets Day 2017” Facebook fundraiser from November 1st – November 30th, 2017 will win a Lone Survivor Foundation prize pack including a signed copy of the book “Lone Survivor” and LSF swag! The winner will be notified via Facebook messenger. Please RSVP to our Facebook Event to get reminders, tips, tricks, and updates! We’re doing a special live broadcast from our Crystal Beach retreat facility on Tuesday, November 28th at about 12:00 PM Central time. We will be speaking with a retreat participant and LSF staff in a panel discussion and taking questions. Our supporters will have the opportunity to donate funds during this broadcast. Please tune in to our Facebook page and share our live video with your friends! 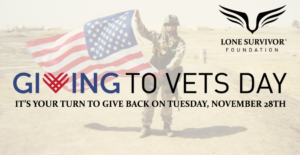 Also, please share #GivingToVetsDay with your friends on your email lists and social media accounts. Please head over to our #GivingToVetsDay Battalion Toolkit for pre-made social media posts, links, and images! The only way we can offer our therapeutic retreats to our service members at no cost is through the generosity of our supporters, and we want you to know that we appreciate your time and your generosity. You are the reason we can continue in our mission to restore, empower and renew hope to our wounded service members and their families. Thank you so much for giving back to our nation’s heroes. Never Quit!